In honor of Frito Lay's new Regionally Inspired Flavors, I was asked to post a recipe of a recipe that reminds you of home. For me, there was only one choice. 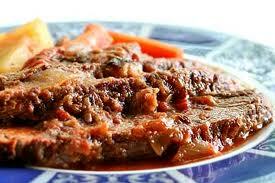 Swiss Steak. I would like to include the disclaimer that I don't particularly care for Swiss Steak, nor did I when I was little, but it definitely reminds me of home. This was my parent's favorite dish when I was growing up, probably because the meat you use in Swiss Steak is really cheap. But, even now, just looking at the recipe, and seeing the picture, I can smell it, even taste it! Frito Lay has come out with some awesome Regionally Inspired Flavors that remind people of their favorite foods! I am really excited to try these! Which one sounds best to you?? For me, living in the South my whole life, it would definitely be Chipolte Ranch or Cajun Herb and Spice! Yummmmo! Frito Lay is giving one lucky Flip Out Mama reader a variety pack of their Regionally Inspired Flavors! Comment on this post and tell me a recipe or flavor that reminds you of home! +1 Follow Frito Lay on Facebook here and tell 'em Flip Out Mama sent you! +1 for each: Enter any of my other current giveaways, and leave a separate comment telling me each one you entered~! Jello salad with cool whip, jello and marshmellows reminds me of home which is Kansas. creamy garden ranch sound yummy!!!! Chicken Fried Steak, I used to do it just like you would fry chicken and my kids loved it!